But her text got me thinking about the answer to this – how I came to spend much of my free time on these crafty pursuits. One way to think about this is to think about the crafting I did in childhood, and of course, who was crafting around me during childhood. As I said in the previous post, my Nanny was a quilter – there is a picture of me crawling under her quilting frame as a baby, and from an older age, I remember it frequently set up in her spare bedroom. 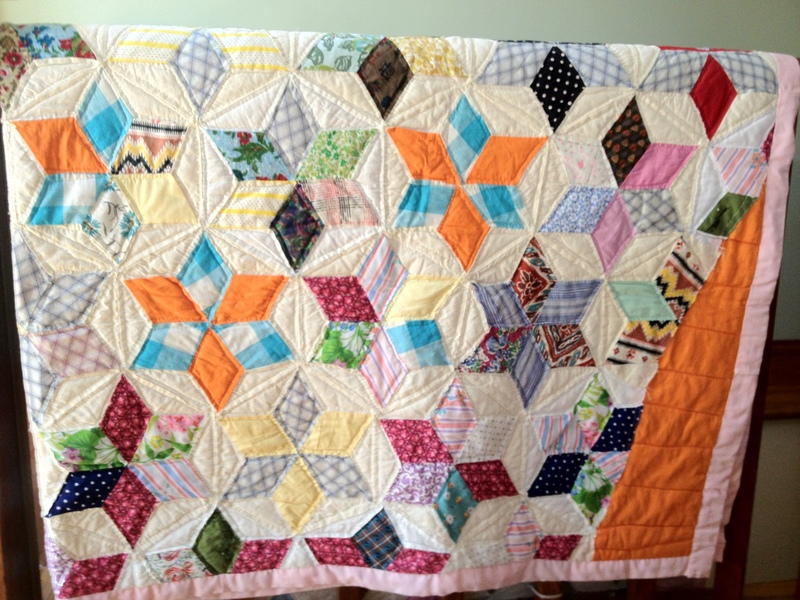 One of Nanny’s quilts that Mom gave to me. Note the large orange triangle in the corner – she probably had a lot of this to use up and ran out of other cut pieces for the stars. Another one of Nanny’s quilts. LOVE this one. I might try to use this as a wall hanging. 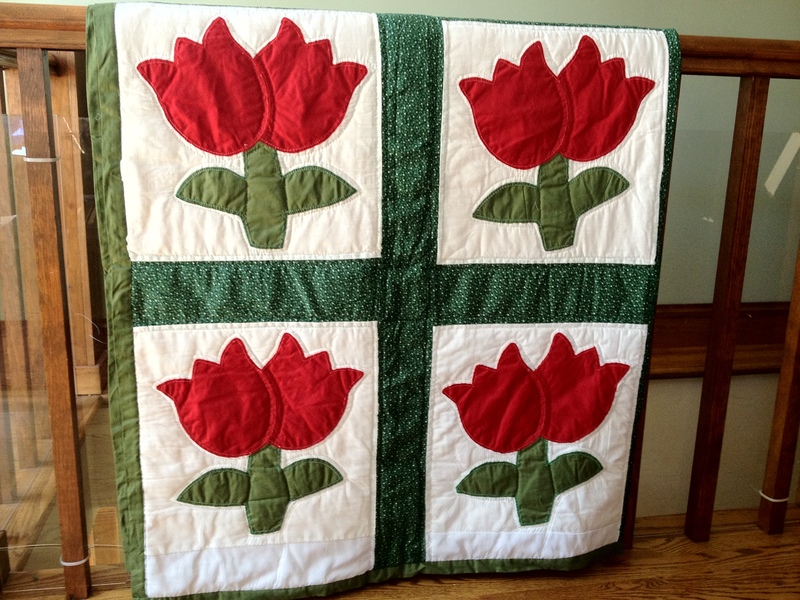 My mom also did some quilting, though I don’t remember her doing it as much as my Nanny. I also remember Mom doing cross-stitch samplers (a couple of these are framed and still hanging in her house today). My dad’s mother, Grandma, is still alive at age 91. Her arthritis keeps her from doing “handwork” as she calls it, but she tells me that she really misses it. She crocheted a TON. I have entire layette sets for each of my children that she crocheted. The Christmas tree at the church in my home town is covered with ornaments crocheted by her and then soaked in some sort of solution to make them still and hold their shape. She needlepointed, too, and my Christmas stocking and each of my kids’ stockings were needlepointed with our name at the top and then sewed by her. Throw I’ve had since graduate school & my first apartment. 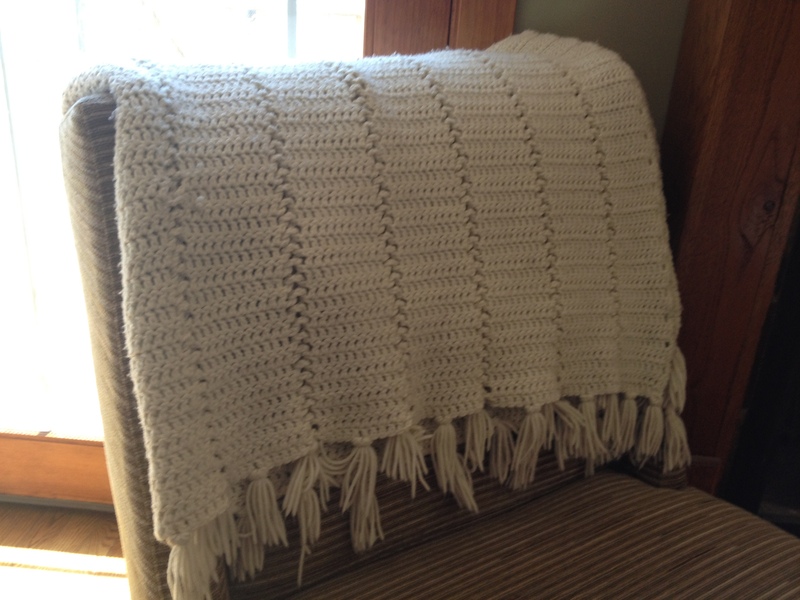 Crocheted by Grandma. Grandma has the coolest sewing machine – the classic Singer Featherweight. They bought it new in the 1950s or 1960s. We didn’t have a sewing machine at home when I was growing up, and I remember going to her house once in high school or college so that she could help me hem a pair of jeans. I think that establishes that many of my influential female family members were crafty. I did know a weaver in my childhood. In the family that we were closest with, the mother A was a weaver. I remember her looms around the house. There were also some very stunning woven wall hangings in their home – I remember in particular one above their fireplace. At some point during high school, she actually gave my mom a loom to put in our basement so that she could teach me someday how to weave. Yes, I’m totally devastated to say that never happened (I was very focused on academics). I don’t know (and my mom can’t recall) what happened to the loom when she sold the house and moved to a smaller one in the early 1990s. As a child I did enjoy doing crafts – not really activities like painting and gluing, but things like basketweaving (done at camp) and simple woodworking (shop class in 8th grade). I learned to sew in a home-ec type class in 7th grade but didn’t really get obsessed. I did some counted cross-stitch, but found it boring. I *really* enjoyed crewel embroidery – there were different stitches to learn, and knots – it was more complicated. This may have been the first moment that I realized that what drew me to crafts was not really the finished object, but the enjoyment of a challenge and figuring something out. I love the way you describe not only the activities that each member in your family did, but also the way that craft showed up in their own homes. I think it’s an important connection to how they saw their handiwork and how we see it today. Great post thanks for sharing.